Good evening everyone! I am here once again with an entry of The Fab Furniture Flippin Contest. 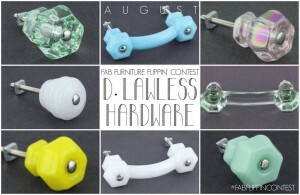 This month, August’s theme is “Icing on the Cake” sponsored by D. Lawless Hardware. A fantastic company with so much to offer, they also were kind enough to give every contestant products to use in their flip. A huge thank you to them! So lets get started. I found this lonely, dark TV armorie on the side of the road with a $30 sign on it. As I went knocking on the neighbors door we I asked if $20 would work. 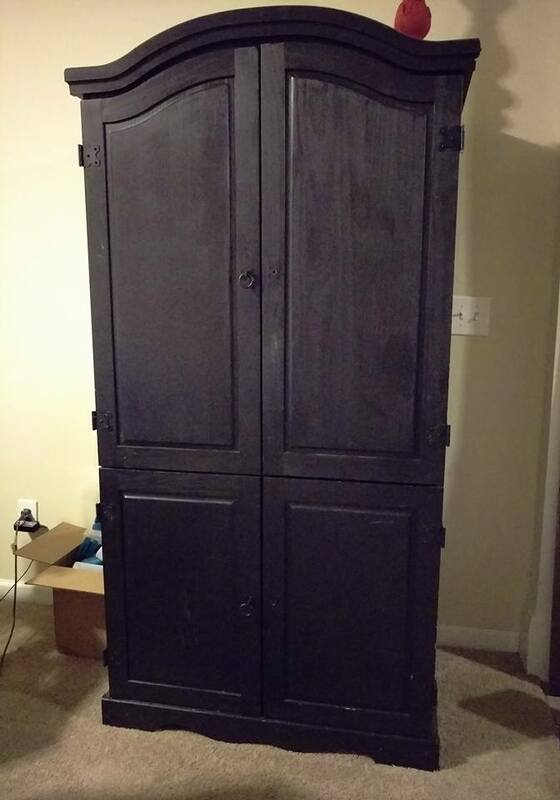 I walked away with a simple black pin TV cabinet missing to knobs and $20 less in my pocket. In my home it sat full of my stock of Shabby Paints till one day this fantastic contest came about with a sponsor to fix my hardware issue. 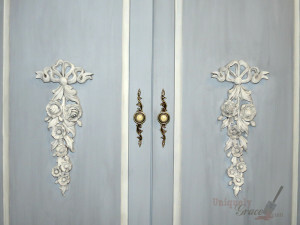 I changed the knobs and plates, the hinges and added seven appliques to the doors and frames. Here is the list of products I used from D. Lawless Hardware. 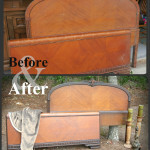 Now that you know the items I used to makeover this sad dark find. Lets look at how Miss Antoinette looks today. OH MY what a looker! I love this theme as “Icing on the cake” as a hobby cake decorator I could not just add the standard hardware, I had to get appliques and create something that was unique and transforming. I fell this fits the theme quite nicely. They are fantastically easy to use and have professional results. Michelle at Dandelion Patina (http://www.dandelionpatina.com/homework-room-cubby/). Click and check out their projects too! 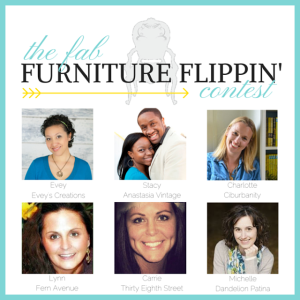 I hope you all have a wonderful evening and make sure to check out all the action for The Fab Flippin Furniture Contest by searching the hashtag #Fabflippincontest. Take a moment to help support me and leave a comment, share this post or pin the images you like best. Thank you! This post was sponsored by D. Lawless Hardware. 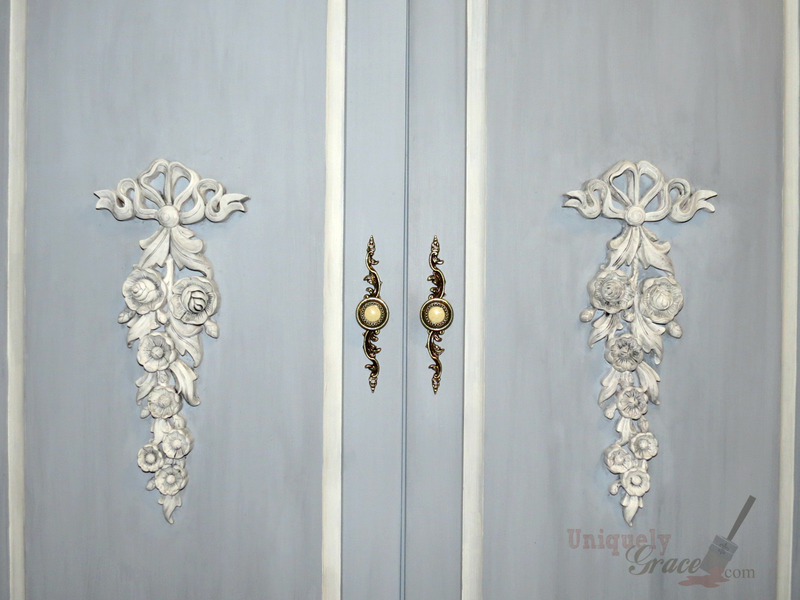 Nice redo Grace those appliques sure add a beautiful french flair! I’ve been meaning to try out some Shabby brand paints for a while now, as I’ve been admiring the shimmery finishes that have been floating around lately. Thank you Brenda! 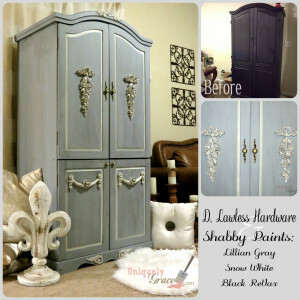 I have to say I love the shimmers by Shabby Paints. I even mix a dab of them into my wood finishes/topcoats to make the wood surfaces glow. 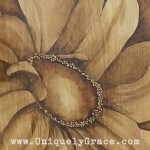 You can’t see the shimmer that way unless you know what your looking for but it just makes that wood look stunning. I just got some pearl in and I can’t wait to try it. This is beautiful and a very smart entry! 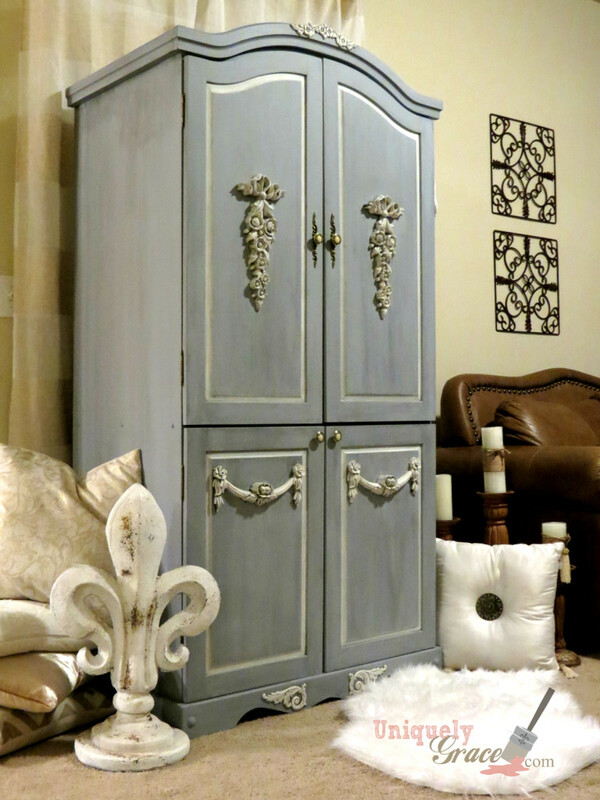 My friend has been encouraging me to use a chalk paint to update some of my treasured wooden pieces. You may have just convinced me to do so and I even have an entertainment center that needs a fresh new look. Thank you for a marvelous redo. Thank you for your kind comment. I am excited to inspire others as I have been so inspired myself. I love wood too. I keep some things wood and some a mix of paint and wood also. 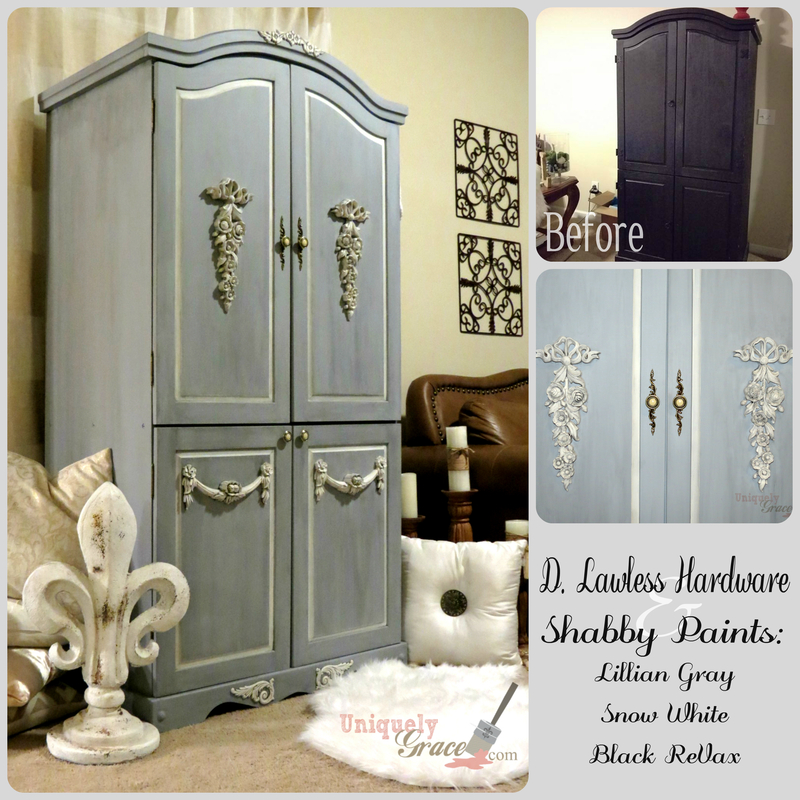 I only use Shabby Paints products as they are so easy and non toxic for my pets and family in my home. If you every have any questions I would be happy to help. I love sharing the things I have learned. 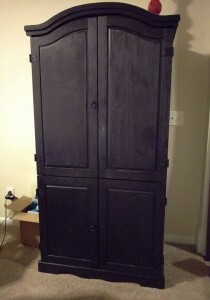 i have the exact same tv armoire and i would love to try this!! I was very pleased to find this great site. I want to to thank you for ones time for this particularly wonderful read!! I definitely really liked every bit of it and i also have you book-marked to check out new information on your web site.